Mobile browsing causes a lot of headaches for data-driven companies. As shoppers jump to different channels and devices, there’s really no way to keep track of them or build a consistent experience. That’s why retailers and brands use mobile retargeting ads to help campaigns connect with shoppers at each touchpoint. And, as our Global Commerce Review shows, there’s no better time to assess your mobile retargeting strategy. In our latest research, we found that mobile shopping accounts for more than 50% of online transactions. And those who use multiple devices to visit a brand’s properties often start on mobile and buy on desktop. In the US, 30% of all desktop transactions are preceded by a click on a mobile device. Shoppers who visit on mobile also spend more, especially if you have an app. Our latest Global Commerce Review shows that in-app transactions dominate in countries like the US, with 71% of all mobile sales occur in-app. Mobile-first behavior is a global phenomenon and shoppers who interact with your apps are often the highest value customers. Our Global Commerce Review findings show that in Asia, shoppers matched across multiple devices spend up to 18% more per order. 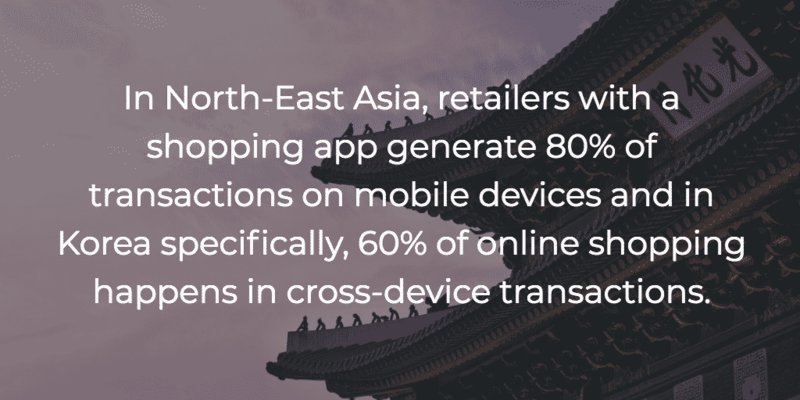 In North-East Asia, retailers with a shopping app generate 80% of transactions on mobile devices. In Korea specifically, 60% of online shopping happens in cross-device . Korean outdoor clothing e-tailer Kantukan worked hard to identify and target cross-device shoppers. The business started running mobile retargeting ads in Q2 of 2015 using Criteo Mobile Retargeting. As a result, mobile revenue doubled year-over-year to account for 25% of sales. The campaign was so successful that Kankutan increased overall revenue by 28% in just two months, while cost per order (CPO) decreased by 45% from the previous year. To continue increasing the efficiency and reach of their ad campaigns, Kankutan is investing in Criteo In-App Retargeting to aim for high-value shoppers that interact with the app. Mobile retargeting ads help build a cross-device journey for shoppers that are anything but predictable. Someone might download an app once and never visit again. But if you use retargeting, you’ll be able to re-engage those shoppers and connect them back with a personalized recommendation. Whether someone buys on an app, the mobile web, or desktop, it’s critical to make sure that you’re offering a relevant experience and a relevant offer. With so many opportunities at their fingertips, shoppers will often only stop to buy the exact thing they need. Especially on mobile. In our Global Commerce Review, we found that this kind of behavior is prevalent across just about every region in the world. Now, it’s up to retailers and brands to figure out a way to aggregate cross-device data lets you understand the winding shopper journey and unlock the potential of matched shoppers. If executed properly, a mobile retargeting strategy can help you reach more shoppers on their devices, no matter where they are and bring them back to make a purchase.